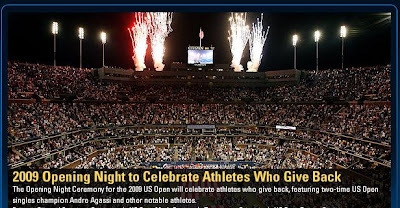 The Opening Night Ceremony for the 2009 US Open will celebrate athletes who give back, featuring two-time US Open singles champion Andre Agassi and other notable athletes. ESPN2 will televise the celebration live, marking the cable network’s first primetime telecast from the US Open. ESPN was named the US Open’s lead cable telecaster in May 2008. Opening Night Ceremonies have become a tradition at the US Open and have been held annually since 2002. Prior ceremonies include tributes to Arthur Ashe, Althea Gibson and Billie Jean King. The 2006 US Open began with a special ceremony renaming the facility as the USTA Billie Jean King National Tennis Center and Agassi’s first round match followed the ceremony marking the eighth time in nine years that Agassi played on Opening Night at the US Open. In addition to the top names in tennis, Opening Night ceremonies have also featured top entertainers and performers including Whitney Houston, Aretha Franklin, Queen Latifah, Diana Ross and Tony Bennett. The 2009 US Open will be held from Monday, August 31 through Sunday, September 13 at the USTA Billie Jean King National Tennis Center in Flushing, N.Y. Arthur Ashe Kids’ Day presented by Hess, a full-day tennis and music festival for children and families, will kick off the US Open for the 14th consecutive year and will take place on Saturday, August 29. The 2009 US Open will feature day sessions beginning at 11 a.m. and night sessions beginning at 7 p.m. from Monday, Aug. 31 through the quarterfinals on Thursday, Sept. 10. Finals Weekend will feature the Women’s Singles Semifinals on Friday, Sept. 11; the Men’s Singles Semifinals on Saturday, Sept. 12; the Women’s Singles Final in primetime at 8 p.m. on Saturday, Sept. 12; and the Men’s Singles Final at 4 p.m. on Sunday, Sept. 13.